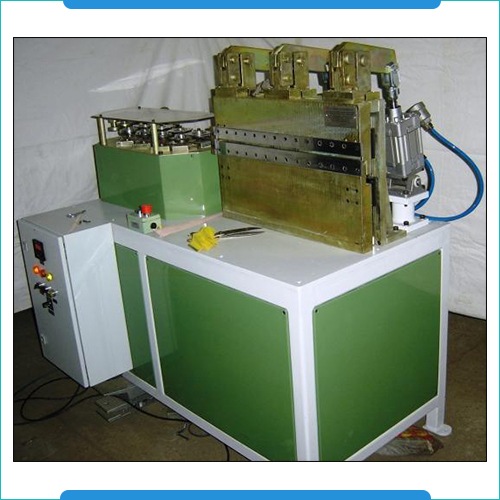 The Paper Edge Clipping Machines find wide usage in paper industries for various applications. These machines come with minimum paper folded height of 50 mm and maximum height of folded paper between 450 mm - 650 mm. Further, these machines features the use of metal ribbon in thicknesses from 0.2mm to 12mm with reel holder equipped with braking device of up to maximum diameter of 500mm. Other than this, the encoder based strip feeding unit as well as pneumatically operated clamping, gripping and cutting cylinders also make these machines efficient in performance. With three cylinder pneumatic press tool operations and pneumatics from SMC or Festo, these machines are also able to achieve optimum production capacity of up to 3000 pcs/shift. Minimum height of folded paper 50 mm. Maximum height of folded paper 450 mm - 650 mm. Metal ribbon thickness 0.2mm width 12mm. Reel holder upto max. dia. of 500mm. equipped with braking device. Encoder based strip feeding unit. Clamping, gripping and cutting cylinders all pneumatically operated. Three cylinder pneumatic operation of press tool. All pneumatics of SMC or Festo. 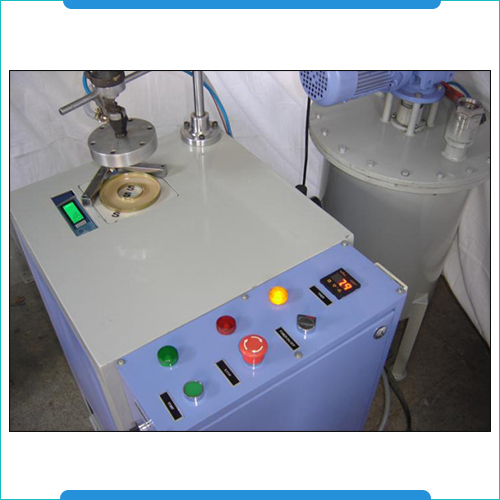 Adhesive Dispensers are highly demanded in the automotive industry for efficient performance. These consists of mild steel fabricated tanks with 60 liters capacity and tank top cover fitted with pressure regulator, pressure gauge, adhesive pouring arrangement, safety valve, FRL unit with slide valve and air release valve. Other than this, the tank bottom comes fitted with drain valve and the outlet for easy cleaning and handling. The dispensing platform comes fitted with SS top, two proximity sensors and timer operated dispensing valves to achieve optimum functioning. MS fabricated tank with 60 ltrs. Capacity. Tank top cover fitted with adhesive pouring arrangement, pressure regulator, Pressure gauge, Safety valve, air release valve and FRL unit with slide valve. Tank bottom fitted with drain valve and outlet. Dispensing station fitted with dispensing valve timer operated. Shower head as per your specification. Dispensing platform fitted with SS top & proximity sensor 2 nos.